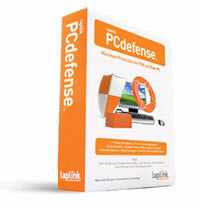 Sci-Tech Today reviewed PCdefense Security Suite from Laplink that offers full protection against a wide range of spyware, crimeware, malware, keyloggers, rootkits, viruses, and other stealth applications. Laplink PCdefense Security Suite can be called the Holy Grail of spyware packages because it bundles several essential spyware-fighting tools, namely SpyAlarm Monitor, Spyware Scan, and Keylogger Prevention, along with a rootkit-detection utility, anti-virus capabilities and disaster recovery tool in a single, self-updating suite. Overall, Sci-Tech Today concluded that “I was impressed with the PCdefense’s scanning speed, which is much faster than comparable software from Laplink’s competitors. Ultimately, however, while PCdefense is designed for those wishing to lock down their computers from known and unknown threats, it should not be trusted as the only security package running on a system. Pros: Comprehensive security tools in an easy-to-use interface; effective and simple backup utility. Cons: Generates too many false positives; lacks comprehensive infection-removal tools; misses some common spyware.